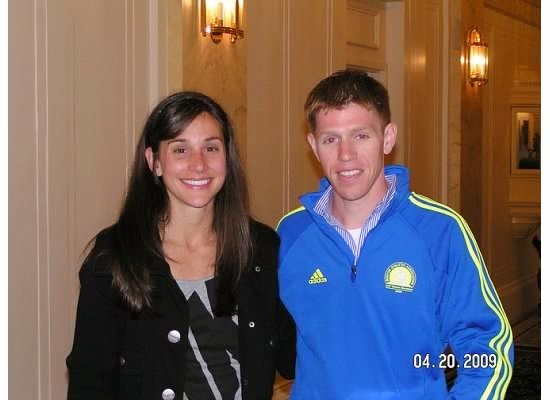 In honor of yesterday’s Boston Marathon, I want to tell you about Matt’s first Boston Marathon in 2009. We found out that Matt placed third in the visually impaired division so we went to the awards ceremony a few hours later. The room was packed with all of the winners—fellow visually impaired winners, overall winners, age group winners, and wheelchair, handcycle and mobility impaired winners—as well as other runners that wanted to cheer on the winners. As amazing as I thought it was to be surrounded by such athleticism, Matt was awe struck. It was like his Academy Awards and he couldn’t stop pointing out some of the well-known runners. 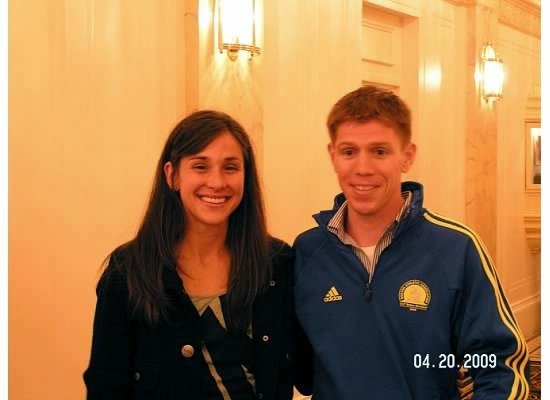 That year there were a number of top American finishers, to include Ryan Hall and Kara Goucher. Matt got to stand up on the podium in front of all of these runners and accept his award. Afterwards, we were near the restrooms waiting on Matt when Matt’s dad and I saw Kara Goucher go into the ladies room. When Matt came out we told her she was there and suggested a photo. So there the three of us were standing outside the ladies room trying to decide who should ask for the photo. How it happened is a bit of a blur, but Kara was very gracious and complimented Matt on his third place finish (she was the third place overall female runner that year). So just to embarrass Matt, I am posting both pictures from that day, the first one where he looks a bit starry-eyed (or embarassed that we were taking so long to get the photo taken), and the second where he was trying to compose himself. Finally, congratulations to all of the finishers at yesterday’s Boston Marathon, particularly the Team with a Vision finishers—you inspire us all!